–Driver support for synthetic devices: Linux Integration Services supports the synthetic network controller and the synthetic storage controller that were developed specifically for Hyper-V.
–Fastpath Boot Support for Hyper-V: Boot devices take advantage of the block Virtualization Service Client (VSC) to provide enhanced performance. –Timesync: The clock inside the virtual machine will remain synchronized with the clock on the host. –Integrated Shutdown: Virtual machines running Linux can be gracefully shut down from either Hyper-V Manager or System Center Virtual Machine Manager. –Symmetric Multi-Processing (SMP) Support: Supported Linux distributions can use up to 4 virtual processors (VP) per virtual machine. –Heartbeat: Allows the host to detect whether the guest is running and responsive. –Pluggable Time Source: A pluggable clock source module is included to provide a more accurate time source to the guest. This version of the integration services for Hyper-V supports Novell SUSE Linux Enterprise Server 10 SP3, SUSE Linux Enterprise Server 11, and Red Hat Enterprise Linux 5.2 / 5.3 / 5.4 / 5.5. Obtain the Linux IC’s via the Microsoft Download Center. Setup was not able to retrieve the service account from the specified Virtual Machine Manager server. Specify a different VMM server and then try the operation again. Check if the SPN for the SCVMM service account is OK. Use the SETSPN -L, or check the account properties using ADSIEDIT or any other tool that allows you to confirm the SPN. If everything is ok you may need to recreate the SCP container that is under the SCVMM server account (In the picture bellow you can check that using the tool ADSIEDIT.msc). To manually create this container, use the SCVMM CD and browse to the \Setup folder using command prompt. Run CONFIGURESCPTOOL.EXE –INSTALL from that folder. This should create the SCP, after running the cmd confirm the SCP creation using ADSIEdit. Now rerun the integration setup and all steps should complete without errors. Note: If you do uninstall/reinstall SCVMM then make sure you patch it to the level it was at before. Up-to-date SCVMM agents cannot communicate with out-of-date SCVMM servers. The full story Aida-s blog. This paper talks about what dynamic memory is, what it does and how it does it. It is a good read for those curious to understand what is happening under the covers. This article steps you through the process of setting up SP1 and enabling dynamic memory. It also gives you some good tips on configuration and troubleshooting. For all things “Windows Server 2008 R2 Service Pack 1” related – the TechNet Center has you covered. The TechNet Wiki also has a “Dynamic Memory Survival Guide” article with some extra links. VMMSSP is not an upgrade to the existing VMM 2008 R2 self-service portal. You can choose to deploy and use one or both self-service portals depending on your requirements. When you monitor some Simple Network Management Protocol (SNMP) devices by using System Center Operations Manager or System Center Essentials, the monitoring may stop intermittently. This issue affects the SNMP performance collection rules or the SNMP event monitors. After you restart the OpsMgr Health service or the System Center Management service on the proxy agent, the monitoring of the SNMP devices continues as usual for a while. However, this issue may again occur sometime later. A monitoring host is unresponsive or has crashed. The status code for the host failure was 2164195371. 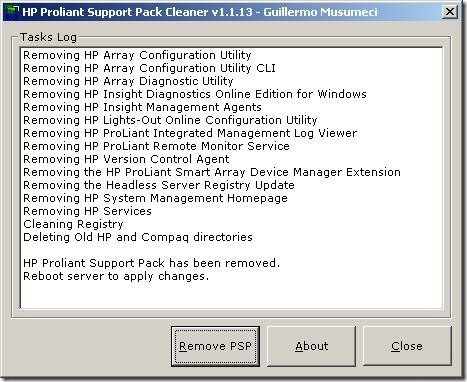 Guillermo Musumeci has written a good tool for removing HP Proliant Support Pack, this tool is a nice tool to use before p2v migrations )you must remove all driver software before you start p2v).